Grilling pork loin isn't tough at all. It's lean and yet moist if grilled correctly. For the price it is really a great cut of meat. World class. Be sure to check out my instructional video at the bottom of this page. I think the best way to grill pork loin is to rub it with a great pork rub and then slow cook it on the Weber grill over indirect heat and then to spread some BBQ sauce on it and finish it directly over the coals or on a gas grill. The sauce will caramelize and become a bit crunchy, resulting in a great texture to compliment the silkiness of the meat. Once the internal temperature reaches 160 degrees Fahrenheit, take it off the grill.Let it rest for ten minutes so the juices redistribute throughout the meat. Another great tip is to let the pork loin reach room temperature before placing it on the grill. For extra flavor use soaked hickory chips in the charcoal. All of this is covered in the video below. 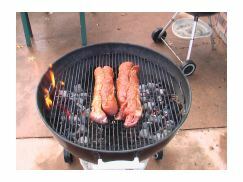 Sign Up for "The BBQ Gazette"
Click here to ask Dave a question about grilling pork loin. Trust me, Dave WILL ANSWER YOU!!! Dave also has a YouTube channel, where he has a lot more instructional videos. Click here to check it out and possibly subscribe.